Eugenie, located on the first floor, is a regal hall with high ceilings and an unusual balcony allowing great options for various events. The banquet is connected to a beautiful terrace which allows it to be used as an indoor and outdoor experience at the same time. Hence it can be used in a variety of configurations, making it a true masterpiece of this facility. Felici is a nine seater quite and cozy boardroom. 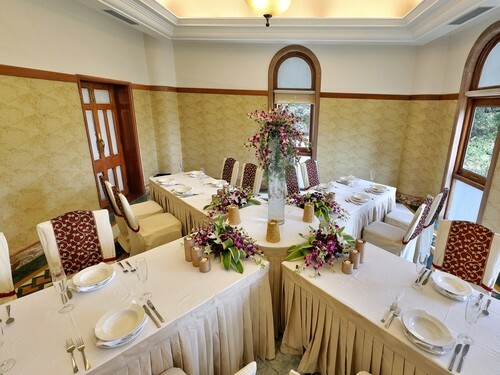 It has a beautiful view of Motibaug Palace and the lush green golf course, hence offering a peaceful and serene ambience. A nine seater quiet and cozy boardroom, the Sir T Madhavrao is also attached to a spacious terrace. It allows you to enjoy the dual experience of indoors as well as outdoors. Rejoice amidst the breathtakingly beautiful lush environs. 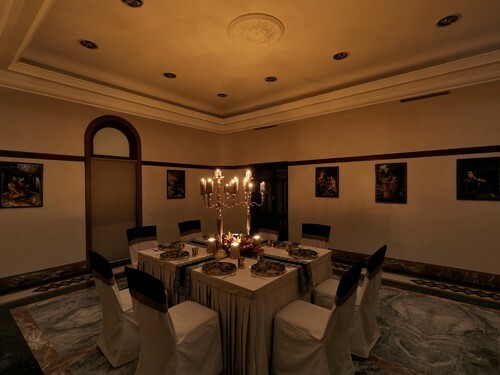 Shri Aurobindo is an exquisite business lounge, providing the ideal environment for any formal meetings. 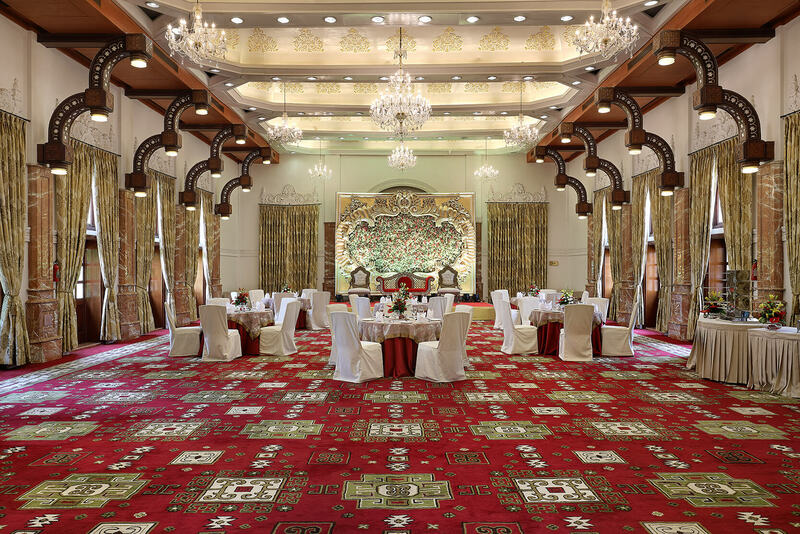 It is a perfect blend of royal elegance and contemporary amenities. 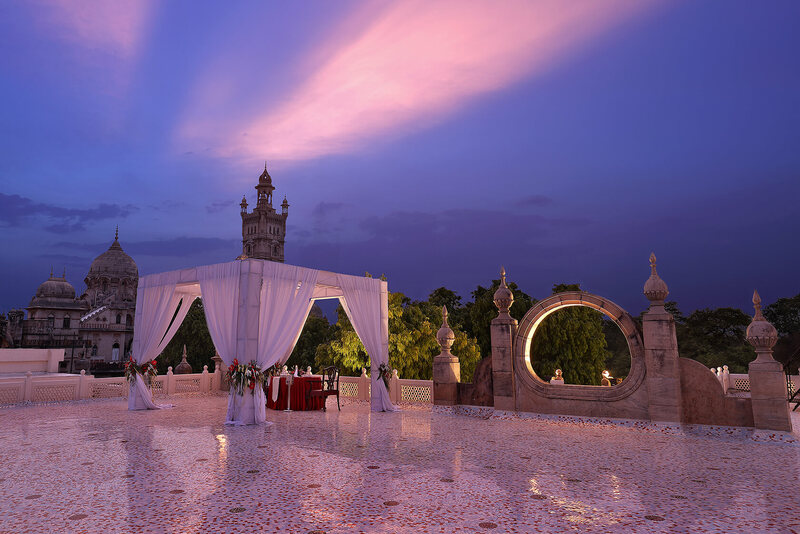 Enjoy the night breeze at the sprawling terrace overlooking the majestic palace tower and dome and the golf course. The only one of its kind in the city of Baroda. A perfect venue for that special winter function. Soak in the celebrations under the starlit sky. Offers a breathtaking side view of the palace . Star Of The South is located on the ground floor and can extend into the lawns on either side to allow for larger events. With its 2070 sq ft of pillar free space, this is the largest of all our banquet space. 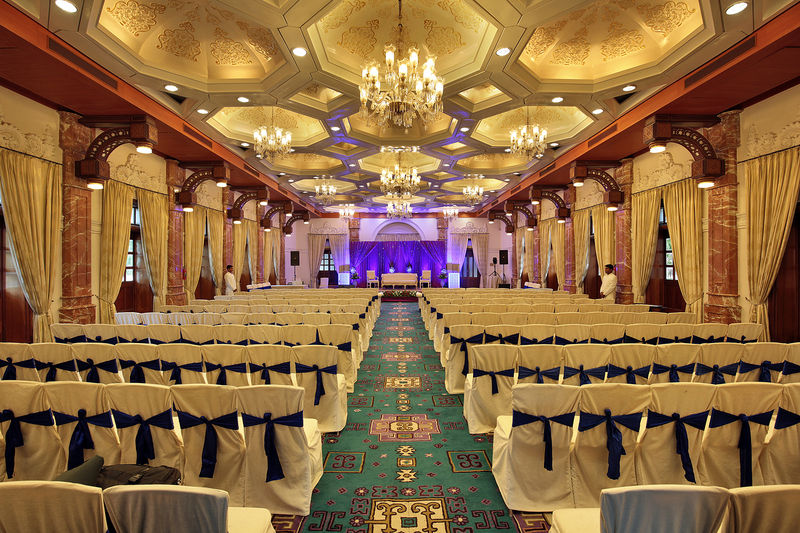 This venue creates an ambience of unparalleled luxury with its wooden interiors and ornate chandeliers. Raja Ravi Varma is located on the first floor with large windows and ample natural light. It opens into a terrace which allows for a great view of the lush green golf course, with golfers teeing off, lending to its ambience as a formal and informal venue for gatherings. The Pool Side Lawn is the perfect outdoor space with expansive greens . The lush lawns with the azure blue pool form an ideal setting for grand receptions and events under the open sky . It also has spacious dressing rooms for the bride and the groom .